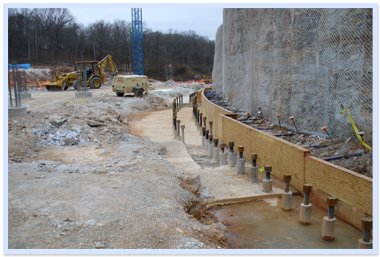 Micro Piles are drilled and grouted reinforced replacement piles of less than 12” diameter. They can be installed in almost any type of soil where the design calls for a deep foundation or anchored earth retention. Micro Piles have the ability to withstand significant Axial and Lateral Loads. Our Geo Construction Division has successfully installed Micro Piles locally with the ability to withstand a load of 320 Tons.